I saw this episode was available on Hulu, read the description about reuniting a family, remembered that this show might be decent, but nothing else about it, and clicked play. I got a bit more than I bargained for. First, a little background. Hey Arnold is a late-90s product of Nickelodeon, and it focuses on a group of kids in a fictional city that’s sort of a hybrid (according to the creator) of Seattle, Brooklyn, and Portland (Oregon). Arnold lives with his grandparents, who own a boarding house. This episode starts off simply enough - scenes of urban holiday fun, kids playing in a snowbound street, that sort of thing. Helga and her friend are walking down the street. (Helga is generally a bully, although she has a secret crush on Arnold.) Helga explains that she’s been asking for the hottest present of the season, official “Nancy Spumoni” snowboots, for months, and if her parents know what’s good for them, she’d better get them. We switch over to Arnold and his best friend Gerald, out shopping. Arnold advises Gerald not to give his baby sister the same present he got for everyone else (a tie), but instead to think harder about giving something thoughtful. Helga, observing this, becomes determined to find the perfect gift for Arnold. 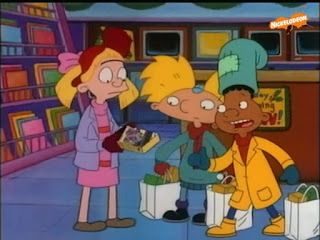 Later, Arnold is home at the boarding house for a Secret Santa drawing. He draws Mr. Hyunh, but realizes he doesn’t know much about him. Arnold later visits Mr. Hyunh and tries to ask leading questions to figure out a good gift. He finally invites the man to open up about what depresses him about the holidays, and that’s when things take a turn for the dark. Now, they never say the words “Vietnam” or “war” or “evacuation of Saigon,” but over the next couple of minutes, we see these events only somewhat edited for children. It turns out that Mr. Hyunh gave his baby daughter Mai to an American soldier 20 years ago to give her a better future. Supposedly, the soldier called out the name of this city as the helicopter left, but it took Mr. Hyunh so long to get to America that he’s never found her. Arnold decides the best, the only gift to get would be to find his daughter. Research leads Arnold and Gerald to a government building where the only man not at the holiday party is Mr. Bailey. Bailey won’t help the kids because he’s too busy, until they offer to do his last-minute Christmas shopping so he can finish up. The boys run all over town picking up gifts, until they get to the last thing on the list. Naturally, it’s the snowboots from the beginning, and they are not to be found at any store in the city. Helga runs into them during this, and after they shoot down one of her “perfect” gift ideas (an expensive video game), she follows them to the government building and overhears the resolution. Without the snowboots, Mr. Bailey refuses to help them look for Mr. Hyunh’s daughter. All the kids head home, depressed, and Helga’s mom gives her a present to open early. After briefly being overjoyed by (of course) the boots, she’s trying them in the snow outside when she realizes her choice. After some personal debate, she returns to the government building and tries to convince Bailey to help her in exchange for the boots. The next day is Christmas, and Arnold is sad that he wasn’t able to pull off his Christmas miracle. The group at the boarding house is just noticing that there’s no gift for Mr. Hyunh when there’s a knock at the door, and the miracle happens after all. This was a really well-done episode. The tone and the humor were carefully balanced and the voice acting on point. I am pretty impressed, and even though I knew what would happen at the end, I enjoyed watching this. Hey Arnold is available on Hulu.